BOSTON, MA -- Another weekend in the books in the Eastern Hockey League Premier (EHLP), and we're now just a month away from the postseason. This past weekend featured a number of great matchups. As is always the case with almost every team in action, there were plenty of worthy candidates for our weekly honors. 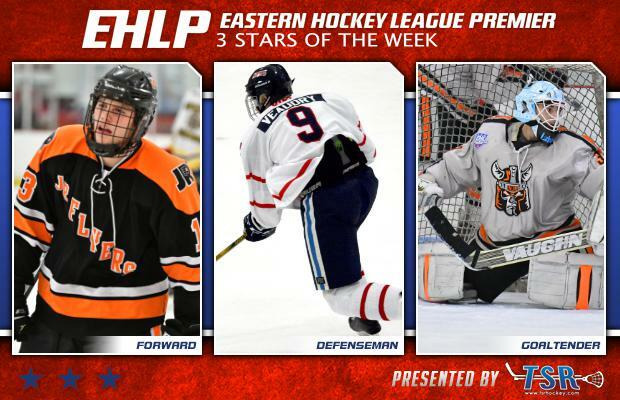 The EHLP is pleased to announce that Charlie Carsello (Philadelphia Jr. Flyers), Will Veaudry (Central Penn Panthers), and Jake Lakatos (New Jersey Renegades) have been named the TSR Hockey Stars of the Week. This upcoming week includes 11 more games from Wednesday to Sunday. The next set of TSR Hockey Stars of the Week will be released on Tuesday, February 13th at 10:00am. Catch the EHLP action all season long on HockeyTV. Carsello and the Jr. Flyers went 1-1-0 this past weekend in their matchups with the Walpole Express. The '99 forward recorded a goal and an assist in his team's loss on Saturday, then tallied a hat-trick and another assist the very next day in the Jr. Flyers 7-6 overtime victory. The West Chester, PA native now has 20 goals on the season along with 22 assists (42 points). The Jr. Flyers will get back to work this upcoming weekend with a matchup against the New Jersey 87s on Saturday, which features the top two teams in the South Conference. Veaudry and the Panthers dropped both of their games this past weekend, but the defensemen battled while recording three goals and an assit over the two games. The '99 was recently named the EHLP Defensemen of the Month for January and continues to rack up the points. The Montreal native, leads all defensemen on his team in scoring with 13 goals and 25 assist (38 points), and averages 1.41 points per game this season. Veaudry and the Panthers will travel up to play the Boston Jr. Rangers this upcoming weekend for a pair of games. Lakatos and the Renegades went 1-1-0 this past weekend, with the '99 netminder between the pipes for both of the games against the Valley Jr. Warriors. The New Jersey native stopped 25 shots in the 3-1 loss on Friday, but bounced back the very next day with a 45-save performance in his squad's 4-2 victory. Lakatos now has 6 wins on the season with a 3.09 GAA and a .917 save percentage. This is the second weekly honor for Lakatos this season (TSR Hockey Stars of the Week #14). 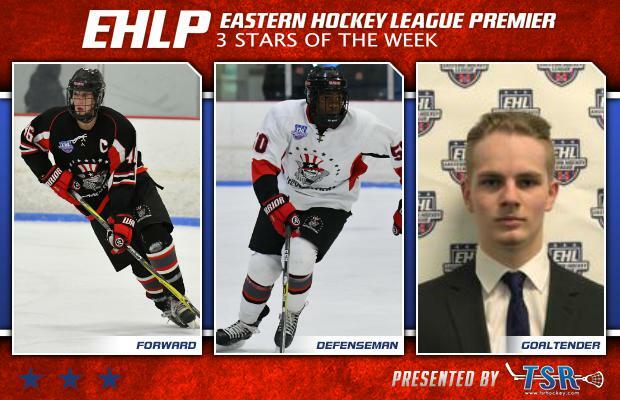 The EHLP would also like to recognize a pair of honorable mentions this week starting with Danila Larionovs of the Boston Jr. Rangers. The Latvian recorded four goals and a pair of assists in the Rangers pair of wins this past weekend against the New England Wolves. William Smith of the Philadelphia Jr. Flyers also put together a solid weekend, with a overtime goal and five assists in two games against the Walpole Express.